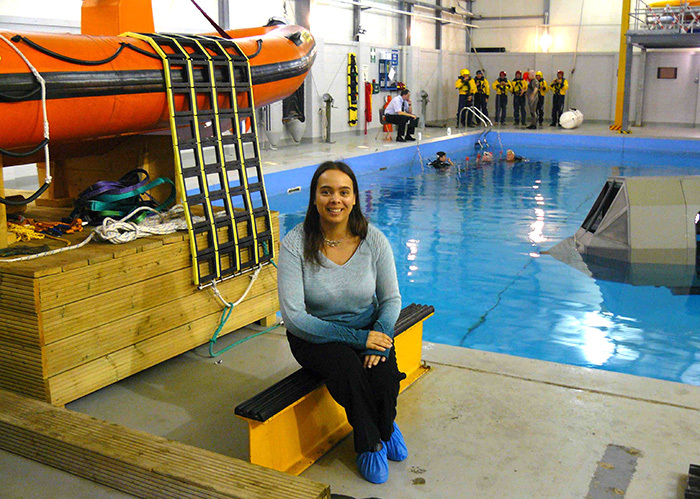 Dr Sarita Robinson has been researching survival psychology since 1999, including acutely stressful situations such as helicopter underwater evacuations and the benefits of training for such situations in facilities like the one depicted above. In this episode I talk with Dr Sarita Robison, Senior Lecturer in the School of Psychology at The University of Central Lancashire (UCLAN). Dr Robinson studies human behaviour in response to life-threatening situations and has been involved with research into survival psychology since 1999. We discuss a range of topics from underwater helicopter evacuations to whether or not you can screen people to see if they have what it takes to be a survivor. I get a surprising answer when I ask what actually constitutes a survival situation. Dr Robinson shares what surprised her when she took a survival training course herself. 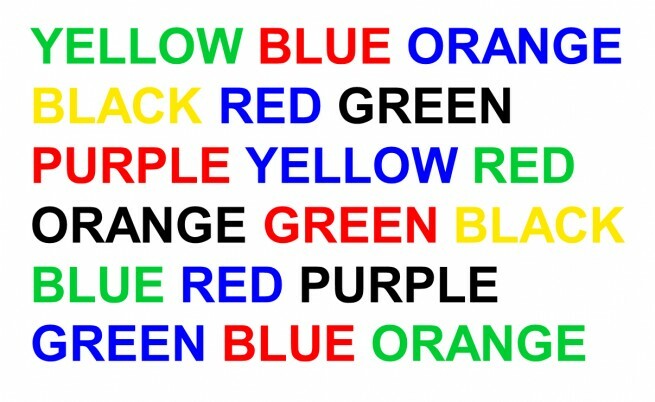 And, apparently, we’re all really bad at the Stroop Task when we’re stressed. Find out what that is – and more – in this episode of the Paul Kirtley Podcast. Representation of the Stroop Task. Listen to the podcast to find out how your cognitive functions are affected in survival situations. Click here to read or download the transcript of Paul Kirtley Podcast episode 001. Thanks again to Dr Sarita Robinson for joining me on this podcast. Great 1st pod Paul as I mentioned on Twitter, it’s good you’ve started with a subject that some don’t pay any heed to, having the skills & kit can help you but it’s not guaranteed to save you, we all go out & practice skills, some in extreme conditions some only go out when it’s not raining ! Many of us may never find ourselfs in a wilderness type survival situation but some do due to unforeseen situations or as mentioned in the podcast a “catalogue” of small incidents that the person/group have not paid attention to & that denial of the situation. I know your not a fan of some of the TV survival shows but what I have found interesting on Discoverys “Naked & Afraid” is some not all of the self proclaimed experts have gone to bits a day or two into the situation predominantly it’s men the women seem able to accept the situation better & get on with it. I think we need to expect the worse & hope for the best we are not always going to be in a situation where we have the kit to make life a bit more tolerable having the ability to make do with what you have & the ability to adapt & improvise as you go on but most of all the mental understanding of what & why you are doing things is something many of us should read up on and try to understand better. People have died in survival situations not from hunger or thirst but just mentally shut down & gave up. When I have the spare cash I will be getting John Leech book on Survival Psycology. Thanks for a great comment, making some very good points. Dr Leach’s book is definitely worth a read and I think you in particular will get a lot out of it. Great first episode and very interesting but please, please, please ditch the cheesy intro and jingle thing as it is really puts your professionalism in doubt. You wouldn’t do it in you videos so why do it here? Thanks for your feedback. Which bit exactly don’t you like? Do you mean the radio sweeper at 00:50? Or the music? Or both? Also, if you could post some links you think are professional (this reads as me being sarcastic but I’m not being) then I’d appreciate it. Thanks for replying – I don’t get that often. The beginning of the show sounds like something you would have heard on Capital FM in the days of Doctor Fox (giving away my age ). A man of your standing in the outdoors community does not need to do that at all. Like I, your listeners will no doubt be loyal viewers of your videos and readers of your blog and would be expecting the same high standard of presentation. I doubt you would start one of your videos in such a way. If you listen to the many documentaries on BBC Radio 4 for example there are dozen’s of internationally recognised sony award winning shows who present factual pieces about the outdoors without the need for unnecessary audio embellishments. Your presentational skills are strong enough to do without these bits of fluff. Your interview with Dr Robinson was a clear demonstration of that in my eyes. A very strong piece which could happily standalone. I hope that helps in some way and I am looking forward to the next episode. When will it be? You’ve made me smile with your Dr Fox comments. Your points about Radio 4 documentaries are good ones too. All of this has been noted and I’m flattered that you think my presentational skills are strong enough to be considered on a par with the latter category (R4) rather than the former (Dr Fox). I will certainly look to remove unnecessary fluff. There are, however, a few things which a Radio 4 documentary on the BBC website doesn’t need to include but a podcast out in the wilds of wider internet-land do need to have. Very early on in the podcast it’s necessary to state the episode number. This is particularly important for people listening in their car, who should not be reading their screens to check they have cued up the correct episode. It’s also necessary to state what the overall theme of the podcast is. In my case it’s “Wilderness bushcraft, survival skills and outdoor life”. This is exactly as is stated in the sub-header of my blog above, so in the context of someone listening here on my blog, it is unnecessary. In the context of someone who has never been on my blog listening to the podcast on iTunes or Stitcher, it absolutely needs to say this. There also needs to be a summary of the contents or high points of the podcast episode. This is a well-proven technique to get people’s attention early and keep them listening as well as helping those who are not interested in the particular contents to go find something more relevant. This may not be as necessary for loyal listeners who will listen to every episode regardless but again it is necessary out on the wider internet, particularly for new listeners. I’ve listened to a lot of podcasts over the last few months and they vary massively in production values. A key thing for me was having a professional production. My priority was high sound quality and there has been a significant investment in equipment and software in order to achieve this. I also employed professional voice over artists for my introductory piece. The music is an instrumental version of a track by a real band (500 Miles To Memphis) for which I have purchased the rights to use the track on any of my internet productions. The choice of music was based on research into the music tastes of the demographic most likely to be listening to the podcast. The sweepers that seem to be the irritation for some listeners were produced by a broadcast professional. Other than that, I record, edit, mix, master, compress and upload these podcasts myself. So, it’s very easy for me to change course as I go, including or excluding any of the elements I’ve had produced for me. I’m very happy to receive feedback and constructive criticism from listeners, take an iterative approach and alter things as we go. For a long time I prevaricated over releasing a podcast. Despite making videos for a few years now, I’m yet to get 100% comfortable with the sound of my own voice and with an audio-only product, I’m moving more out of my comfort zone. The first episode was never going to be perfect and it’s likely that every episode will always have its detractors, particularly as my listener base increases but I figured I’d get the first one out there and then hone, refine and perfect as I go. As Seth Godin says, at the end of the day you just have to “ship it”. The second episode was already completed and uploaded to the media server before I released the first episode. It is scheduled for release next week. So, I will not be able to change the intro to episode 2 but based on your comments and the comments of a couple of other listeners, I will make a few alterations to episode 3. The interview for this has been recorded but I have not done any other work on the episode yet. Episode 3 will be released the following week. I don’t intend to produce a podcast per week every week but I wanted to do a fast turnaround of the first few episodes, partly because it will allow me to iterate the production relatively quickly before the New Year. Thanks again for your input Tara. Couldn’t agree more. The pod cast itself was very interesting and entertaining with a very well picked first topic but the intro and outro were very cheesy. I understand the desire (and maybe even necessity) of branding but the 90s radio DJ style needs to go! Can’t wait for more episodes as I’m sure this project is going to go from strength to strength. Please see my reply to Tara. Great first pod cast Paul, very interesting topic and one that could go on for ages. Can’t wait for next one. Cheers Danny. Thanks for letting me know you enjoyed it. I enjoyed it very much – Thank you Paul! It’s good to hear from you. Thanks for your positive feedback on the podcast. I’m very glad you enjoyed it so much. Hi Paul well done on your first podcast. I think some very important messages brought up here. I know I’ve said it before on the blog but Ile say it again”Hope for the best but plan for the worst” , if your in a scenario that after doing a risk assessment in your head has the potential to become a survival situation then visualise your self doing what needs to be done. Mussel memory through training may not be there to help you in that situation but a plan can be the next best thing. In a survival scenario let your psychology work for you not against you. It’s always good to hear from you. Thanks for listening to the podcast and thanks for your comments. Glad you enjoyed it. The second episode will be out soon. I’m pleased you appreciated the sound quality. It takes a bit of effort but it’s well worth the effort. There are a lot of podcasts with poor audio – almost unlistenable in some cases – and good sound quality is something I wanted to nail right from the start. The next one will be out next week. That was brilliant. Quite refreshing have some people that actually know what they are talking about when it comes to survival. You see a lot these days people making claims in blogs about survival with nothing to back it up what they are saying, or going into discussing kit in a infinite loop of “best of’s” knife, axe, stove, etc. Know I have to go about to find out what my limits are to bust my confidence, an do so without putting myself at some silly risk. Thanks for your comments. I’m very happy you enjoyed this podcast. With respect to furthering your understanding of your own limits, to do this safely you should seek either an organised survival training course OR a knowledgeable mentor or group of experienced people who will remain outside of the experience you (and possibly others) are going through to act as safety. When you are cold, tired and hungry, you do not make decisions very quickly and those decisions can be poor. The safety person/team needs to be fresh, warm and well fed so they can monitor you and act quickly in your favour if necessary. This was thought provoking and inspiring stuff. I hope that it gets a much wider audience than those of us already interested in the subject. As you both made clear, anyone can find themselves in a situation where they need the sort of knowledge discussed here. I have to agree with Tara Chambers and Marc about the intro however. I do hope you didn’t pay too much for this “professional” input. It was the only unprofessional aspect of the podcast. As such it was in marked contrast to the two professionals I heard sharing their expertise so eloquently. Thank you both. I look forward to the next episodes and will fast-forward over the intro! It’s good to hear from you. It’s been a little while. Thanks for your kind words about the content and your constructive criticism on the intro. the other great book on the subject is the survivors club. by ben sherwood. very much on a par with deep survival. there is a website with a survival psychology questionnaire that accompanies the book. well worth a look. i run survival and bushcraft courses for scouts & scout leaders. we sometimes get young people having a bit of a melt down on courses. i know things like leach’s 10/80/10 rule are often trotted out on survival courses. interesting to know, but ultimately not much practical help. i find the aspects of psychological first aid to be a much more useful tool, and something that i don’t think is given enough emphasis in survival training. it’s certainly something that helps to get a traumatised youth back on track and into the game with renewed energy. Great addition to your already superb blog. Having experts like Dr Robinson, I found it especially interesting to question her re well-used techniques in survival to see how they stand up against psychological research. Keep it up, young man! Thank you my friend. It’s good to hear from you Steve. Hope all is well with you. Good work on the first podcast (although, I’ve heard podcasts from you before? I guess that was on other people’s shows). Hmm how about: instead of re-training decades of daily experience for millions of people – releasing the seatbelt from the buckle at our hip – we just put a car-seat-style emergency belt release next to the hip in commercial planes and the 5-point harnesses of helicopters? It seems to me that although survival depends just as much on harnessing our psychological assets as that of tangible or physical resources (e.g. our physical endurance, objects in our environment), the science behind psychological reaction to crisis has still a very long way to go. Perhaps about the only useful advice is drill and simulation. And even this is limited in its generalisability. Although I found it very interesting to learn how social support networks also help – perhaps meeting up for a beer with mates tonight could in some small way help me escape a aircrash next month! Sorry of I missed the link, but is this available on iTunes ? Hi Steve, not yet but it will be. I’ll be sending out an email when my podcast becomes available on iTunes (and Stitcher). What a very interesting guest. Some of her points were maybe obvious, such as practice and testing yourself. I thought the observation that a Positive mental attitude doesn’t always help was a real eye opener. Thanks for your comment. Glad you found this interesting. I agree some points were maybe obvious. BUT they also need reiterating. How many people actually go out and properly test themselves. Easy to get comfortable with your skills. Also, in the context of the conversation I had with Sarita Robinson, how many times have you seen the frequent flyer ignoring the safety brief on a flight. Yet statistics would demonstrate that most people don’t do what they are supposed to in an emergency. I think the answer is “always be training” however obvious (and repetitive) it might be. Good comments my friend. Thanks. Hi Paul, really enjoyed the podcast and with a background in psychology it was particularly interesting to listen to Dr Robinson apply the science of psychology to survival situations, which I had not previously considered. I think that part of having psychological strength to survive ( long term) is the ability to ‘face yourself’, which is not based on muscle power but self insight and self awareness which you need to have done prior to the survival situation. I listen to quite a few podcasts particularly when driving, my cents worth is .. not a great surprise here …. the intro music from 0-58 seconds was a bit jarring and seemed somehow at odds with the theme of your podcast…music with fire crackling, bird song and rivers flowing would have got me more into the groove! I guess you have to choose your music in relation to the target audience as well as the theme of the podcast. I sort of assume that the age group listening to your podcasts will be 35+? so maybe music needs to be more in sync with that age group. I know that there has to be a distinctive memorable intro but in my opinion in needs to be short being 30 seconds which includes the intro words too, anything longer and you want to fast forward, which you you can’t in the car so it is a bit annoying. Thanks for your thoughts on the podcast. Much appreciated. I’ll be taking into account all the comments here for the production of future podcasts. Hello from across the pond, Paul! Excellent choice of subject and very informative, for that, thank you. Obviously there is only so much time in a podcast of which you couldn’t have maximized any better. Would be very interested in knowing if Dr. Robinson, based on her research, believes the older studies still apply on the effects of hormonal/fear induced heart rate increase and the impact of fine, complex and gross motor skills. I have seen some debate on the subject and would appreciate your and her knowledge. I’m glad you found the podcast interesting. With regards to your question, I’ll see if I can get Dr Robinson to reply directly here. Sorry for the delay in replying. The weeks before the Christmas break are always manic for marking. There is no doubt that when the brain is put under pressure it does not cope very well. Like all parts of the body it has a optimal range in which it works well – the minute you take it out of that range then it starts to fail. For example, when we do not get enough sleep we get impairments with creative thinking. Older studies have shown impairments in fine motor skills in some stressful situations. I have only found these impairments when people are placed in extreme heat or cold. Motor skills appear to be preserved when people are faced with situations that increase anxiety (but which are not too physically demanding). However, other higher cognitive functions (such as memory, attention, decision-making) do become impaired. I think that the old studies are useful but as we continue our research the new tools available such as fMRI scanning and saliva assay for hormone levels have allowed us to refine our understanding of how the brain is impacted by survival situations. However the research which has been done so far has not looked at what happens to the brain when several adverse factors occur at once. So researchers have looked at what happens to the brain when we are sleep deprived or when we are hungry or when we are scared. But very few studies have looked at these factors in combination. At last found the time to listen to the podcast. Very interesting and enjoyed it very much. Looking forward to hearing the other two. Loved listening to this in the wee sleepless hours Paul. Learned new things, applicable to my critical work situation as well as outdoors. Thanks for all ur work, time, dedication and sharing. Loved listening to this in the wee sleepless hours Paul. Learned new things, applicable to my critical work as well as outdoors. Thanks for all ur work, time, dedication and sharing. Glad to be able to keep you company and that you enjoyed our discussion. “critical work situation” not critical work, sorry. I would add well-deserved kudos for the excellent podcast. I am looking forward to getting caught up and hope and trust that they will continue. I am also looking forward to getting into your blog and reading up there. I feel blessed to have come across this. As a psychologist (here in Memphis, Tennessee, in the U.S.), I couldn’t be more pleased to hear you welcome the perspective of my discipline on your first podcast. I also look forward to reviewing Dr. Robinson’s work and the work she cited. From what Dr. Robinson indicted, it seems that a positive attitude or expectation does not seem to bear up in survival situations. In my work with spinal cord injury, resilience and thriving in adversity is sometimes predicted by a construct referred to as “fighting spirit.” While I do not know the literature in this area (yet) I would be rather surprised if this has not been considered. It seems that it would bear on some of the scenarios you discuss in the podcast, especially when someone is beset by multiple “small” problems that cumulatively create risk (e.g. dehydration, disorientation, fatigue). In any case, I am eager to continue listening. Your podcast has become a regular for me. Thanks for your comment. Welcome to my blog and podcasts. I’m very glad you have found me via the podcast with Dr Robinson and I’m glad that fueled your professional curiosity in this area. Please do keep in touch and follow up once you have read the work cited by Sarita. Please also feel free to leave comments on the respective pages regarding the other podcasts. They are all different to each other but I hope you find them equally engaging and illuminating. A really interesting listen! Thanks. I don’t know if you have ever come across the BBC 2 Horizon documentary on ‘How to Survive a Disaster? (easy to find on You Tube) it really complements some of the points Sarita makes. The point Sarita made about keeping kit safe also reminded me on a section in Robert Perkins’ film ‘Into the Great Solitude’…. He’s filming a piece to camera about his little bone handled knife. He’s on some rocks at the side of the river . He’s explaining how this knife is not only useful but how he also has an emotional attachment to it. As he’s explaining this, the knife slips from his fingers into the river and is gone. the next few minutes sees him lamenting his own stupidity as losing something so vital. I’m looking forward to catching up on your back catalogue. Thanks for your comments on this podcast episode as well as your recommendation of the Horizon documentary. I shall seek it out and have a watch. Thank you. I look forward to hearing your thoughts on the other podcast episodes. Started listening on Podcast 13 with Ray Goodwin and 14 with Mark Kalch – now back to the beginning with Podcast 01 – and very interesting stuff as usual!! P.S. Really liking the “Ask Paul Kirtley” episodes and also the blogs – you are going to be keeping me busy for a while!